Owen’s Presentation, originally uploaded by bill kralovec. I listened to Owen’s presentation on Bolivia. The first grade class in celebration of International Week in the Lower School, had all of the students give presentations on a country of their choice. Most students chose either nations of their families or where they spent most of their lives. At an international school, there is always a lot of mixed families. 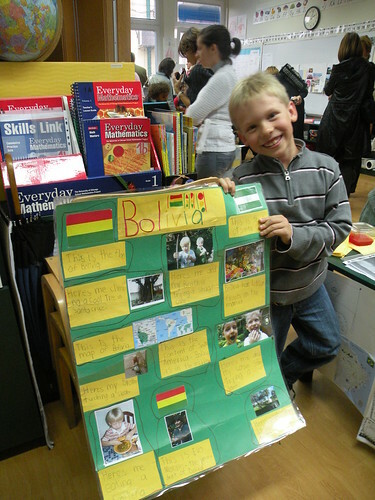 Owen chose to do Bolivia because there are not many South Americans in Serbia. He was also born there and is a Bolivian citizen. We spent several holidays there and he also had an extended stay when Ocean was born. Owen had many photos and stories to share with the parents and people at the presentations. He also finally got a haircut last night. This is the shortest he has had his hair in a long time. He looks very different! I didn’t recognize him when I first walked in today. He did an excellent job and we are proud of him. Way to go Owen!!! !